A metaphorical environment “Cultivate Your Mind in the Orchard of Knowledge” pays tribute to the history of the Santa Teresa neigborhood and to the Public Library’s mission. The theme relates the purpose of a library -- education or cultivation of the mind -- to the literal cultivation of the region’s orchards. The design celebrates the vitality of the community from its argricultural heritage to its thriving growth. The metaphor of the orchard also allows play on words, using literature and language as an inviting mind game. The art work consist of three elements: “Fruits of Knowledge Walk or Orchard walk”, “Tree of Knowledge” and the “biblio-tree”. When patrons enter the library, they experience the “Fruits of Knowledge Walk” and see the titles of books, poems, movies which contain the names of different fruits on the floor. The selection of worldwide authors reflect the diversity of the community that uses the library. These images are stainless steel and stoner embedded in the immediate approach to the building and the entrance floor. 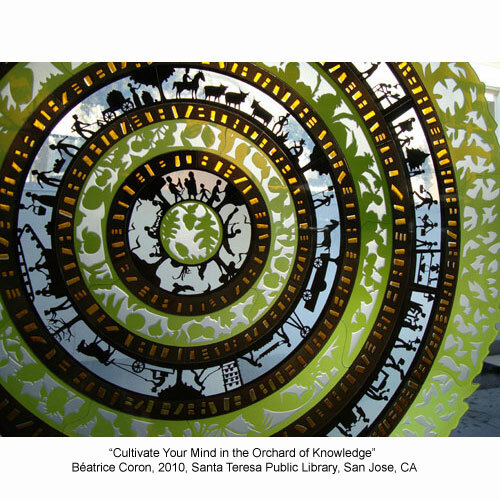 Part of the “Fruits of Knowledge Walk,” an etched welcome mat, is placed at the entrance to the library.with the words “Cultivate your Mind in the Orchard of Knowledge” with the image of a book growing like plant and two persons tending to it. Three designs for the “Tree of Knowledge”, fabricated by Derix, are placed on the windows at the entrance of the library. Concentric rings depicting San Jose’s history and growth alternate with graphics showing plants from various parts of the world that were brought to the region. The growth of the city can also be seen as a “mandala of experience” that is both figurative and decorative. The large medallion (80" diameter) is visible from most areas of the library. Two smaller medallions (40") are placed to be seen at closer range , one at an adult size point of view and one lower for small children. The design different orientation on each rendering to convey a dynamic of movement. This design celebrates many aspects of Santa Teresa's community past and present, including native American Ohlone culture, ranching, orchard groves, fruit canning and , wild life with turkeys and wild pigs, Silicon Valley, cultural life and festivals, sports and outdoors activities. A biblio-tree is made of stainless steek and backed by korten steel for the trunk and copper for the branches. The design of the tree is composed of international writing systems, these roots of words become books and other library materials on the branches.